The formal complaint lodged by Delhi Chief Secretary Anshu Prakash regarding the way he was assaulted during a mid-night meeting on Monday at Delhi CM Arvind Kejriwal’s residence will send a chill down anyone’s spine – if this is the way a senior Government officer can be treated, what chance does an ordinary Delhi citizen or anyone (like volunteers, leaders) who fall foul of the Kejriwal coterie stand? 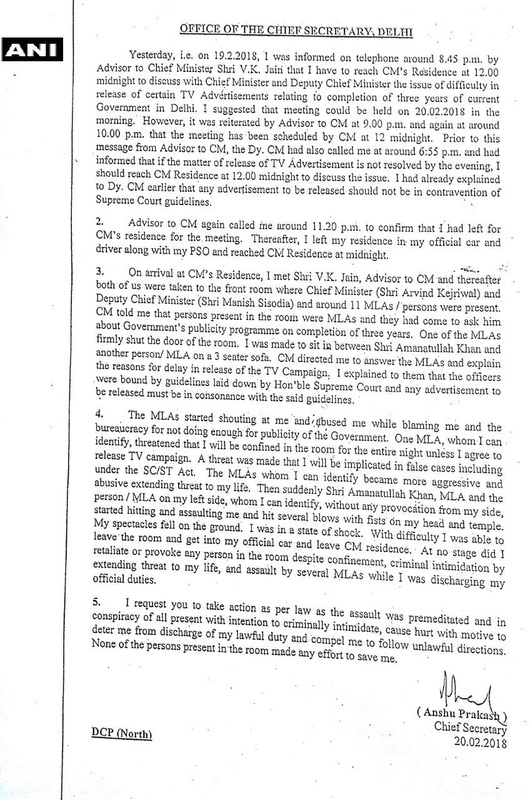 Fact that meeting was held at an odd hour (midnight) and was attended by 11 AAP MLAs apart from CM, Deputy CM and the CM’s Advisor, indicates prior planning to corner & intimidate Anshu Prakash. Making a senior officer sit between 2 MLAs on a 3-seater sofa is another intimidatory tactic aimed at unsettling him by invading his personal space. The threats to hold Prakash hostage for the whole night, implicate him in false cases, threat to his life, the abuses and finally the assault – “Amanatullah Khan and the MLA on my left…..started hitting and assaulting me and hit several blows with fists on my head and temple. My spectacles fell to the ground. I was in a state of shock.” – must be unprecedented in our electoral democracy. Last heard, things like this happened in Bihar in early/mid 90s where Mr fodder used to say to IAS officers: "Jutta se maarenge.. jo kehte hain karo chup chap". He spoke like this while sitting on one chair and keeping his feet on another. This is what an Urban Naxal govt looks like. Highly deplorable behaviour exhibited by public representatives towards the top most bureaucrat of Delhi administration. Anshu Prakash #DelhiChiefSecretary my batchmate is a thorough gentleman and I strongly condemn the way he has been manhandled. Arvind Kejriwal was the great hope for the liberal media in the 2012 – 2016 period, when he was plugged as the clean, young challenger to Narendra Modi. The sheen has worn off considerably from Kejriwal due to the tragicomic events involving AAP over the last 3 years, but there are still many die-hard Kejriwal fans in our national media. One of them is Zakka Jacob from CNN-News 18 who is well known for his shrill, unbalanced anchoring style. Jacob claimed that his channel had obtained CCTV footage that showed the CS “walking out just fine, not like a man who has been assaulted.” The sensational hashtag that he chose for the tweet -#AAPVsBabus – giving the impression that somehow the whole IAS lobby was plotting against AAP. What is this video that Jacob and his channel were bandying about as ‘clinching evidence’ of AAP’s innocence? Yes, it appears from the video that the CS Anshu Prakash is walking out from Kejriwal’s residence in the video. But did the CS claim that he was assaulted with sticks & sharp weapons that would leave hims bloodied or with clothes tattered? No, he said that he received blows on his head and temple – the kind of assault designed to leave no easily discernible trace. And even if the CS had received just one slap, are Jacob and his ilk saying that is acceptable? Incidentally, Anshu Prakash’s medical examination, conducted on Tuesday night at a Government hospital in Delhi after an FIR was registered for the assault, has shown injuries on his face and elsewhere – tenderness and mild swelling behind both ears, swelling over the right zygomatic (cheekbone) region and a bruise on the lower lip (1cm x 0.5 cm size). Other media outlets like PTI, Economic Times revealed their latent anti-BJP bias by anointing CS Anshu Prakash as a ‘BJP leader’! Such is the solid reputation that Anshu Prakash enjoys, that even ace Lutyens’ operator Shekhar Gupta, who has mastered the art of Lutyens’ access journalism & ‘running with the hare and hunting with the hounds’, was forced to acknowledge the polite and soft-spoken nature of Anshu Prakash. But even in this tweet, Gupta managed to play both sides – while on the one hand he says that it is difficult to imagine the mild-mannered Anshu Prakash provoking any clash, on the other he hints at Prakash’s closeness to a BJP leader and calls what happened “unfortunate turn of events”. So the message between the lines is – ‘BJP could very well have stage-managed this whole episode”. There is no outright condemnation for the liberal (hence obviously morally superior) Kejriwal, unlike the contemptuous torrent of insults that would have ensued if BJP MLAs & CM had been similarly accused. Kejriwal, Lalu, Rahul, Mulayam, Mamata, Owaisi, Sonia, Yechury are truly blessed in that they possess the “outer paint of left-liberalism” that deflects the sort of criticism and scrutiny that other politicians, especially those from the ‘indescribably evil and fascist” RSS/BJP camp have to face. How is Kathua Juvenile Accused’s Name Revealed in Chargesheet and MSM Reports? What Ails Police Officers in Congress Ruled Karnataka?